This morning we left Oberwesel to make the short journey to Koblenz - the place where the River Mosel flows into the Rhine and a city that can trace it's history back to 9 BC when the Romans gave it the name Castellum Apud Confluentes - The Camp at the Confluence. Our intention had been to park on a small Stellplatz right on the river edge, but there was only room for 10 vans and when we got there around lunch time it was already full. 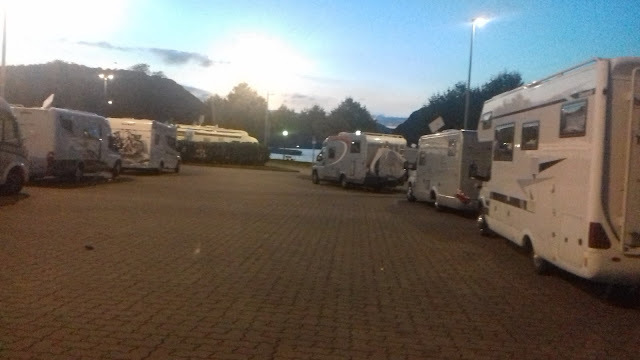 'Never mind' we thought, 'we'll go into the camp site right next door' - we did and got stung to the extent of 34 euros for the pleasure, and if we'd opted for a river side pitch the price increased to 44. I don't think we've ever paid quite so much before, but having said that, it was very convenient for the sights, and as usual we'd only allocated the afternoon to see them all in! 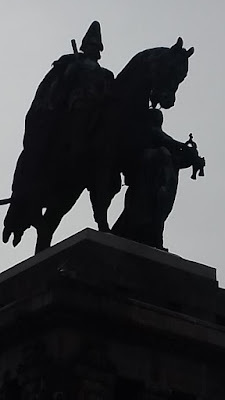 So, with our list of the ones we most wanted to see compiled, we set off get a closer look at Deutches Eck and the enormous equestrian statue of Emperor Wilhelm I that stands on a massive podium towards the back of it. The initial statue on this site was erected in 1897 but that was destroyed in World War II and replaced with a copy in 1993. And it really is quite breath taking, but unless you've actually seen it, it's quite hard to put into perspective how big and awe inspiring it is. 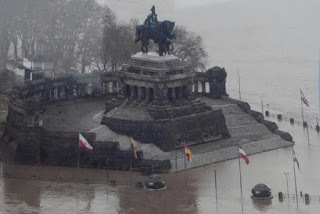 The statue itself must stand at least 30 feet tall, but with the podium upon which it is set, it towers about 80 feet over the confluence of the rivers and dominates the skyline for anybody travelling towards it down the Rhine. 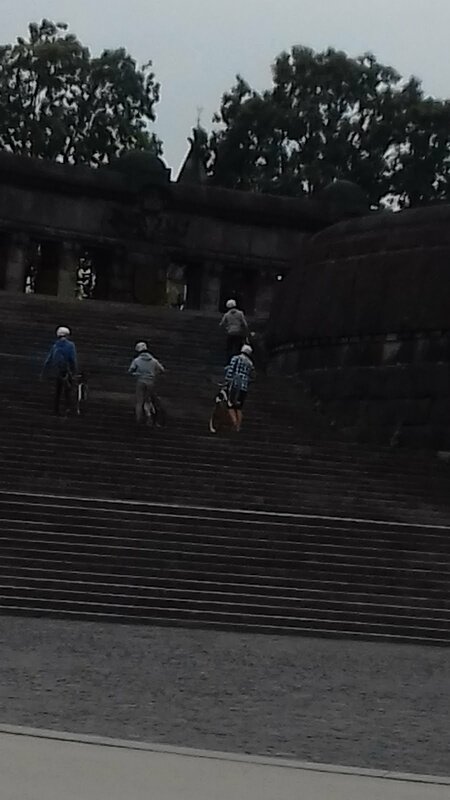 While we were there we were also entertained by a group of young lads lugging their bikes up the steps below the statue. We discussed if it was likely that they intended riding them down, they did, and quite skillfully, but when John suggested that we might try it - I quite politely declined and told him of a place he could go! Also, while we were pottering around the Deutches Eck we found quite a few of these. I did debate if we could take one home to use as a doorknocker, but on reflection, I thought it might cause T4rdis2 to be on more of a wonk than usual! Next we went to see the History Column - a fountain that is called Historiensaeule. It is located in a square named after the poet Josef Gorres and was erected in 1992. It stands 10 metres high, and if you get to close you run the risk of being spat on by the figure at the front of the rowing boat! 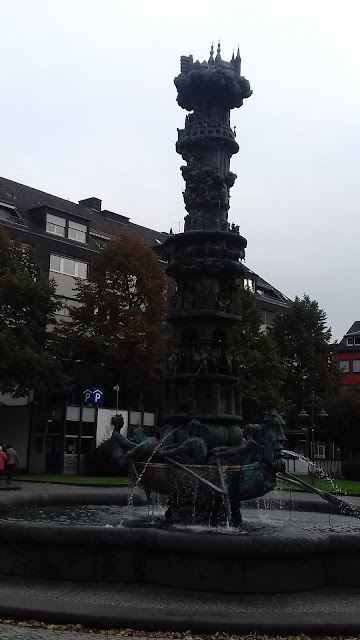 It was created by Jurgen Webers and represents the history of Koblenz from the time of the Romans (at the bottom of the fountain), then around the middle it shows the French and Prussian revolutions, a bit further up is the destruction the city suffered in the Second World War, and at the top the rebuilding of the city is represented. 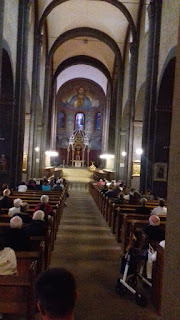 Unfortunately, the light was quite poor for taking pictures, so sorry, but couldn't do better that this. 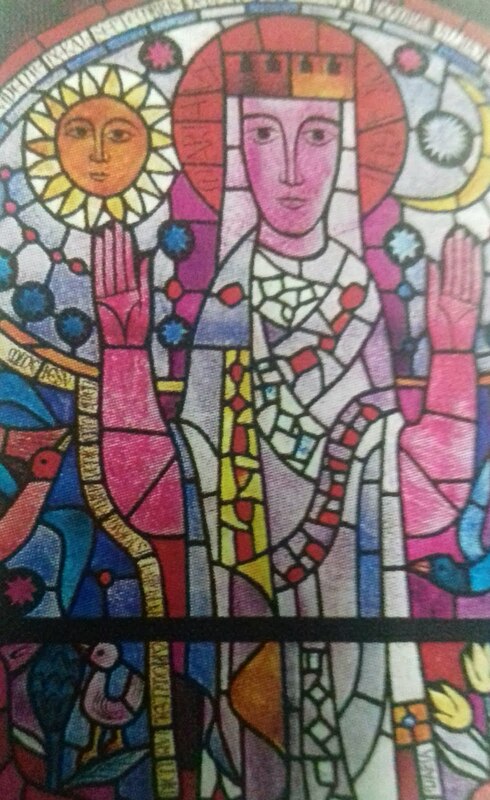 We learnt that the first church on this site was consecrated on 12th November 836 AD, but even before that, investigations proved that the site was used by pre Christian cults for several centuries. The present appearance of the church however, is as the result of work from the 11th and 13th centuries. Obviously, there was loads more to see and do in Koblenz, but I think I've told you before, we're not really 'City' people, so apart from admiring the facade of the Kurfurstliches Schloss, along with several other statures and fountains, we were soon heading for home where we were hopping to be able to sit out in the late afternoon sun - thus making the most of our expensive camp site! But it wasn't to be, cos the weather deteriorated and rain was soon pitter pattering on the roof. Oh well, the beer tasted just as good inside as it would have done out! So, instead of the Mosel, we've decided to carry on heading North until we get to Germany's bit of the North Sea! Then we're slowly going to wend our way, mostly tracking the coast, back through the Netherlands and Belgium, then into France to catch the ferry back to Blighty from Dunkirk! Saturday 15th October 2016 - Another mixed bag weather wise - but we did get to see the sunshine in the afternoon, and the evening was positively glorious. This morning we left Koblenz and headed a few miles further down the road to Maria Laach where an Abbey stands at the side of Larrcher See - not the real sea, but a lake formed in the crater of an extinct volcano. Now, there are only so many religious buildings that you can enjoy going to see in a fairly short period, but as we were here it seemed a shame not to have a peek. 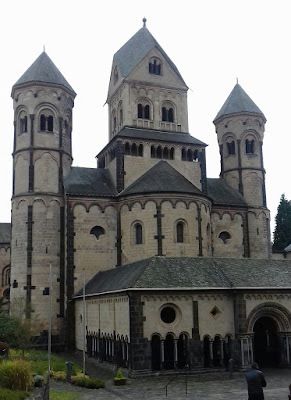 The Abbey was built between 1093 and 1220 but has obviously seen numerous renovations since then. 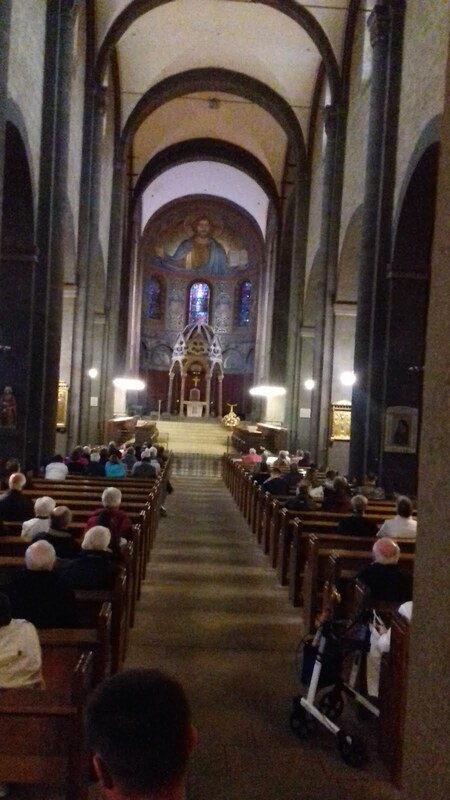 And more recently, since 1802 it has been the home of the Benedictines, and even to this day it is said that the church regularly resounds with Gregorian chants several times a day. 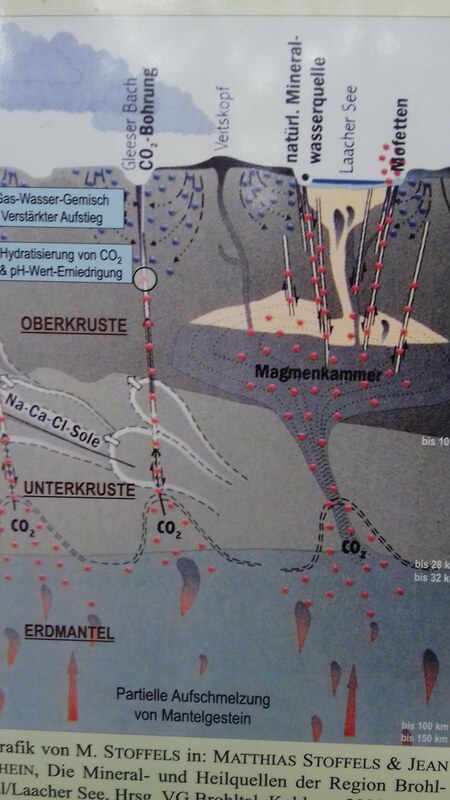 Anyway, after our 'peep' we set about our real reason for visiting this area which was a walk to circumnavigate the Larrcher See which is now part of the East Eifel Volcanic field. Apparently the lake was formed following an eruption approximately 12,900 years ago, but today there isn't really much evidence of it left to see because the lava was quarried for millstones from the Roman period until the introduction of iron rollers in the 1900's. However, when the eruption occurred it is thought that it lasted for about ten hours, and that the plume reached a height of about 35 kilometres, and then volcanic activity lasted for several weeks. As usual we had our picnic lunch with us so we had a late lunch sitting on the lake's shores, but we really did need to be very careful what we munched! This was because, over our heads there was a high canopy of autumnal broad leaf trees, and every now and then when a gust of wind caught them, acorns would rain down and try and hide in our sarnies - we did wonder if there was a vindictive squirrel hiding up there somewhere! 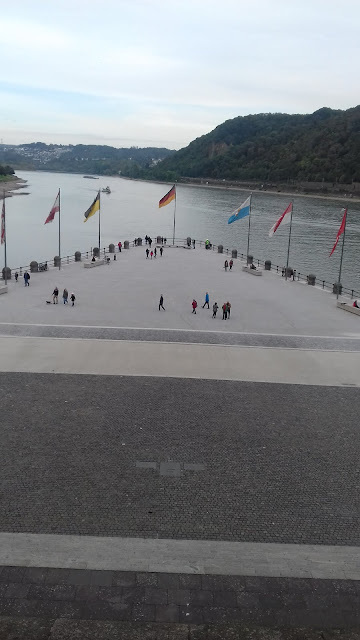 Once our walk was complete we headed back towards the Rhine to the town of Andernach where John had spotted a huge Stellplatz that would hold 70 vans. To say the least it was busy, and we just managed to sneak into the very last space. 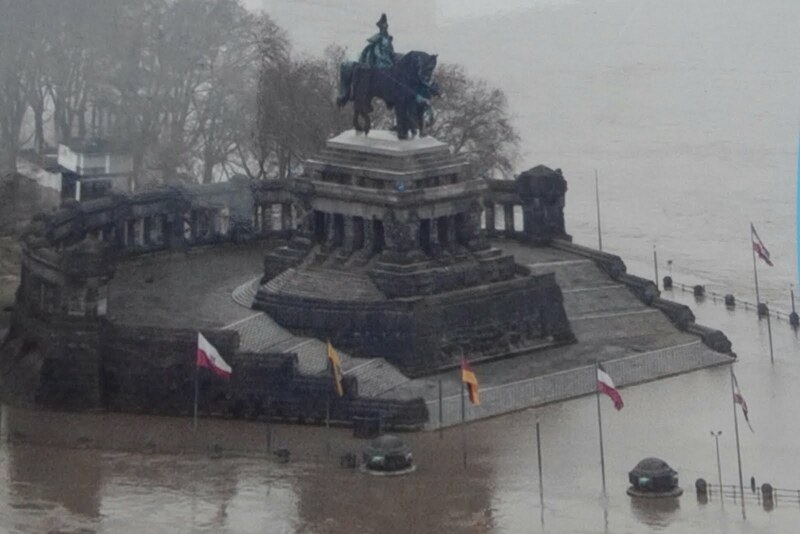 And how lucky we are - we've got a lovely river view, the sun is shining and it only costs 7 euros. 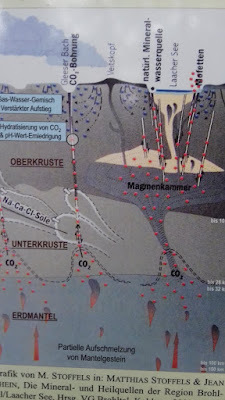 Also, there is an old Geyser here that is a unique natural spectacle. No, it's not a male -it's of the water kind and is the highest cold water geyser in the world - apparently it regularly reaches 60 metres and is driven by CO2. The blurb says that you can catch a boat to go and see it but we're hopping we can go by bike - but that will be tomorrows story. The view from our front window! Sunday 16th October 2016 - a lovely sunny warm afternoon, but this morning you could hardly see a hand in front of your face - did I say it was foggy! When we drew the blinds back this morning it was just as if we'd landed in a lake of pea soup, so we are holding the weather fully responsible for making us change our plans! 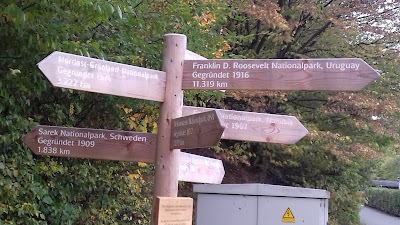 We really didn't think it was worth setting of to see the Andernach Geyser in that lot, and additionally we'd realised by now that the only way to get there was by boat - you have to pay your 28 euros to get into the Discovery Centre and then the trip to the Geyser is the second part of the deal. Therefore, in the morning we stayed snug inside T4rdis2 and had a look for campsites and Stellplatz that we could use on our up to the North coast, and then in the afternoon, when the fog had cleared a bit, we set of on the first leg of that journey. We plan to travel about 80 miles each day, but as usual, if we find somewhere nice we'll stop off to enjoy it. 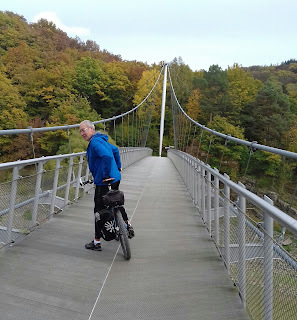 So with that in mind our goal for today was a Stellplatz in the Northern Eifel region which is just over the border into North Rhine Westphalia. 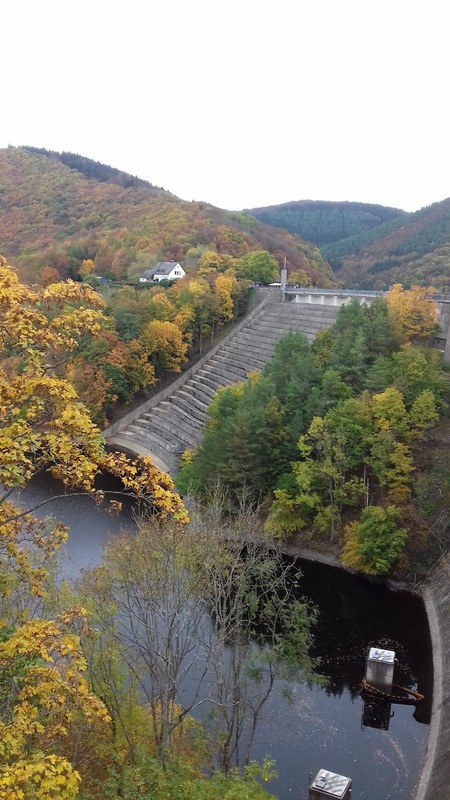 We had read in our guide book that this area has low forested mountains that line the valley of the Rur river which has been dammed in several places to form artificial lakes. Therefore, we thought this would be another lovely place to cycle, and with all the fantastic autumn colours that is exactly what it proved to be. By the time we arrived the sun was shining and there was hardly a cloud in the sky, but it was a bit too late to do more than have a very pleasant walk around the nearby village of Rurberg where we found a bench and sat and soaked up some of the rays. Monday 17th October 2016 - a bit cloudy but fine and warm with occasional glimmers of sunshine. 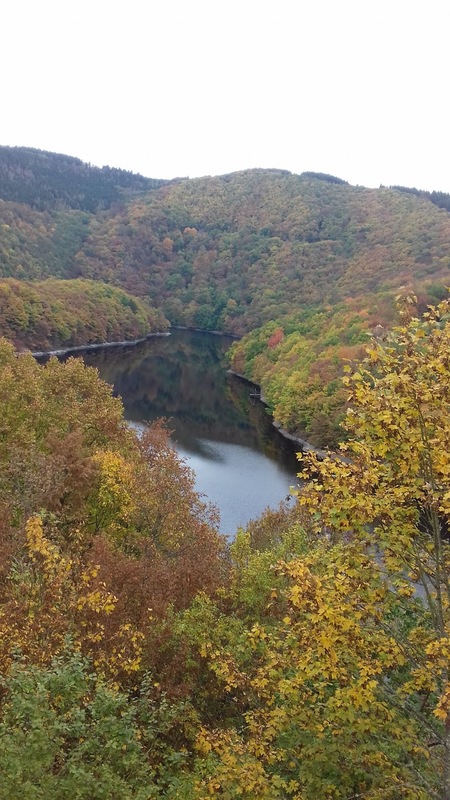 This morning our bikes were soon unloaded and we were off around the lakes that are set in the dramatic landscape of the Eifel National Park. I say dramatic - there really is no need to go as far as New England in America to see The Fall - all you need to do is come here. Most of the trees in this area are ancient old broad leave ones that carpet the valley sides for as far as the eye can see, and there colours at the moment are stunning - some of them almost looked as if they were on fire. 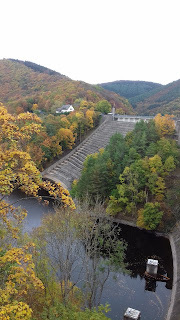 We rode around one arm of the reservoir for a distance of about 25kms, but when we got back to the Rurberg we thought that wasn't really far enough, so we set of along another track that followed the riverside until it reached the massive Urftseestaumauer - the hydroelectric dam that was built in 1904. We dawdled here for a while to admire more of the stunning scenery that was all around us. However, all good things come to an end and we eventually had to tear ourselves away and continue our journey, and when we saw the signs on the right we considered for a moment is we should aim for one of the places indicated - maybe not it was a bit to far for today! So instead we set off back to T4rdis2. 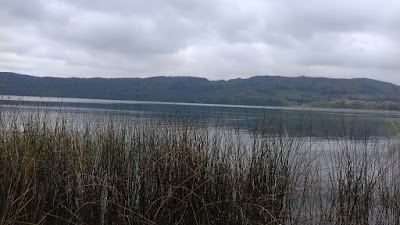 but on the way home we stopped off at a bird watching station to see if we could spot any of the wildlife that might be roaming in this area. There are supposed to be wildcats, deer, woodpeckers, black storks and many more, but all we managed to spot were a few ducks and geese! 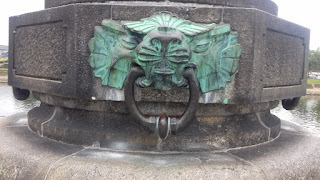 However, I did see this strange creature on the Victor Neels suspension brucke (bridge) that was erected in 2009! I think he was trying to leave without me but I soon caught him up! 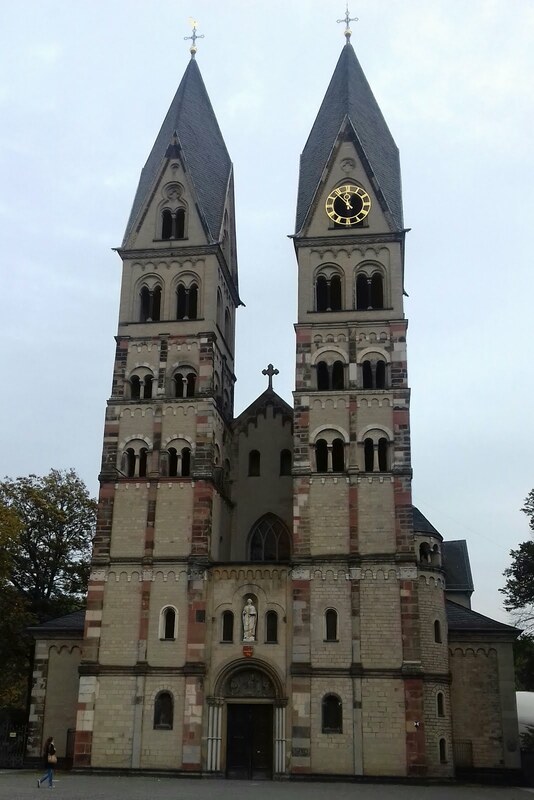 Tomorrow we're going to move back to the Rhine and nip into Cologne to see the Cathedral, and then after that it will be a bit further north.